Stars whose luminosity can be regarded to be distributed continuously over the volume where they exist. For example old bulge stars or OB stars which are not embedded in dust. OB stars in dense clouds. 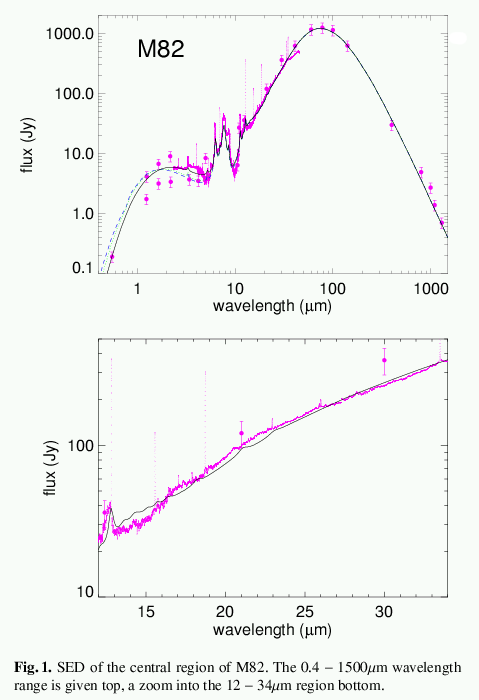 As the circumstellar dust reprocess the stellar light its emission must be evaluated in a separate radiative transfer computation. The outer radius of this dust envelope is linked to the strength of the galactic radiation field. Visual extinction 2 < Av < 150 mag. The SEDs library contains 7111 models. It can be downloaded as tar file from: HERE and usage is described in a README file. Part of the starburst library can also be downloaded as IDL structure. the radiative transfer model: Krügel and Siebenmorgen, 1994, AA 282, 407. PAH cross section used: Siebenmorgen et al. 2001, AA 377, 735 . Dust absorption properties and photo-evaporation of small grains is discussed by Siebenmorgen et al., 2004, AA 414, 123 . A textbook description of the dust model and the radiative transfer is given in chapter 12 and 13 in "The physics of interstellar dust" by Krügel (2003) .